The Whiteley family of St. Clair Shores, Mich., celebrated the one-month birthdays for Alexander, Nicholas and Timothy. The brothers were born Jan. 25 at Henry Ford Hospital in Detroit, and spent nearly a month in the newborn intensive care unit. Multiple births don't run in either of their families. "Not even twins," Lauren Whiteley said. I think that the Detroit couple will be very shocked and surprised to see that they have three identical triplets. It is not that common for people to have triplets but it is even more uncommon to have three identical triplets. 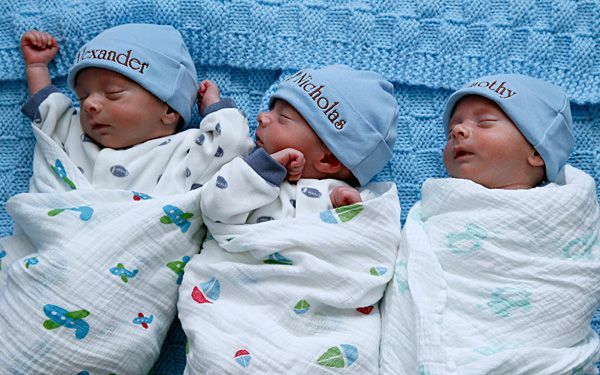 Doctors say that it is a one in a million chance for someone to get three identical triplets. I hope that the family can take care of the three children well. The parents also have two older children and are getting a bigger family. The parents now have to adjust to their new lives after the triplets and take care of them well. The new addition of a triplet might have been able to almost double the size of a family that they were seeing that they are going to get twins but they are going to give birth to a triplet at a hospital. The people might have been able to see that it has been a chance that the family will be able to give birth to a triplet in one day which they aren't going to be the same identical baby. The family might have been hoping to give birth to a twin but there had been a chance for them to be giving birth to a triplet which the family had gotten a big surprise. People might have been able to think that the family had been able to get a surprise for themselves because they weren't expecting to give birth to a triplet which is a very rare chance for a family to give birth to a triplet. Critical Thinking Question: What do the two older brothers need to adjust to? Answer: The two older brothers need to adjust to get used on their younger brother which the family had been able to give birth to after the two other brothers were given birth.